Reimagine Schools is the newest podcast to join the Education Podcast Network as of August 2018. We're excited to offer a podcast that covers such an important area of education. 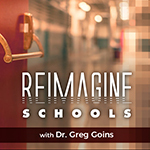 Hosted by Dr. Greg Goins, the Reimagine Schools Podcast features many of the nation's top educators, authors, and innovators in P-12 education. Join the conversation as we "reimagine" how Future Ready Schools can transform learning for a new generation of connected students.